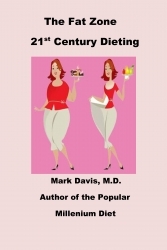 "The Fat Zone 21st Century Dieting" takes a quantum leap over weight reduction programs. Utilizing cutting edge nutritional science this diet regimen far exceeds programs on the market. This diet's menus are easy to use, require no expensive foods or purchase of prepared meals and can be used anywhere. Had enough with celebrity diets? Try this one, you will be pleasantly surprised with the results. Abingdon, MD, February 19, 2018 --(PR.com)-- Enter "The Fat Zone 21st Century Dieting" into the mix of weight loss programs on the market. Strengthened by advances in nutritional science this cutting edge program leaps over others offered on the market. Effective, economical and safe, this program has caught the eyes of many in the field of medicine. For simplicity and rapidity of weight reduction, few programs come even close. Written by the author of "The Millenium Diet the Practical Guide for Rapid Weight Loss," his newest e-book encompasses an array of sciences allowing the dieter to see significant reductions in weight over a short time period. Menus in The Fat Zone are extremely easy to follow, can be utilized on the run, in a restaurant or at home. There are no prepared meals to buy or expensive subscriptions to purchase. Physicians are now recommending this program as an alternative to the antiquated regimens they used previously. The author, Mark Davis MD, has decades of experience treating diet patients and his efforts are clearly visible in this program. This book is available anywhere e-books are sold. To contact Dr. Davis: platomd@gmail.com or 410-515-7858.